I received some complaints last week after my harmless little rant about someone killing my own kind. Things got a little heated. Some of what I said was taken out of context, by an unnamed individual *cough* Cal *cough* but I will do better to dole out advice without letting my passion seep through. Thank you. How can I get through to my husband that he's being unfair? Who the heck has a farm in Chicago? Well I'll let that pass for the moment. The problem with your husband as I see it, is that you have not authoritatively shown your position. Therefor I suggest leaving the nest for awhile. Let him see if really feels henpecked when you're not there to mind the chicks. Why not head south for the rest of the winter? I hear Brazil is nice. Once he's gotten enough of having to do your work, he'll come fly after you. Be warned though, a friend of mine tried this once, and her husband ended up pecking their children to death. But I guess you can't expect anything more from a chicken hawk. They have no self control. Phew, glad I didn't make the list from that previous comment. Anyways...I will answer using the expressive form of interpretive dance. Of course you cann't see my performance but know that everyone who has seen it can't hold back their tears or emotions as I end my performance with a complete vacuuming of your nest. Take the hint. I bet you never migrated a day in your life. "No, I winter in Boston and summer in Baton Rouge...look at me. I am posh." Well I got rid of that comment. I love it when I can get that kind of thing posted for no apparent reason. 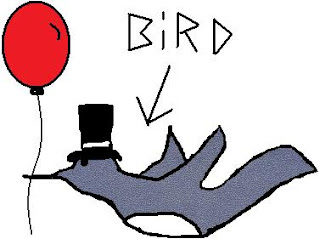 I don't know what all this hatred for the bird is. I just hope you know what you're doing. Could be one day you look back on him with a fondness. It's not the bird per say...it's hus SMUGNESS!! I do so hate da smugness. Unless I am someone doing the smug. You'd be smug too if you were voted best advice columnist since Ruth Crowley 10 years in a row. You are bringing Ruth into this? And I would like to see that voting pool...from his fellow 'hat club for birds' members I assume and Ruth was hat-phobic to hear her tell it. It may have been as judged by a group of his peers, but so what? We're willing to condemn a man by his peers, can't we commend one by the same action? Damn you for your relentless logic and appeals to my sense of fair play. Gentlemen, I'd like to enter this discourse, but I'm rather confused by it. I'll just put in another vote for the robins. We don't. We riff of each other like a couple of old vaudvilians. And don't think I didn't notice how you brought in another person with a bird name into your blog. Slick. But I see right through it. The Swan? Actually that's a pretty killer nickname. I'm keeping that. Scary organ music too. What have I started? It funny how it begins by making a joke and suddenly I am in my own personal episode of 'Lost'. Want to know what is really scary? I dreamed about swans a few night ago after I watched a joke on Frasier about them.